"Dozens of organizations from the anti-war movement are gathering to protest the "wars that won't end in our lifetime," the undermining of civil liberties, and militarization of police in America. These, of course, are among the many direct consequences of 9/11. Thousands will be coming to Washington, D.C., for the March 18-21 protest. We are also gathering — in order to convey to the marchers and watchers this message: The most direct way to peace is to reveal the truth about 9/11. 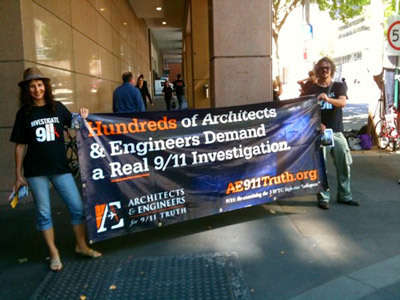 Architects & Engineers for 9/11 Truth strongly believes that more Americans are now ready to embrace truth and that it is vitally important that our work be made known to the peace activists. During this event, we will convey to the marchers and onlookers that we have more than 2,300 technical and building professionals who stand behind the forensic evidence and the video and eyewitness testimony that prove the official account of 9/11 is a myth. This audience needs to know that a third steel-framed skyscraper—one not hit by a plane — came down at free-fall acceleration on September 11, 2001. This fact alone should cause the assembled activists to Rethink911. 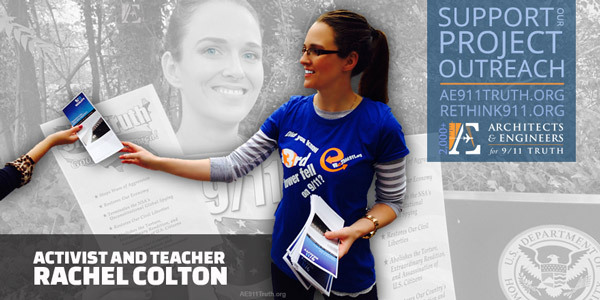 Our Rethink-themed vinyl banners and brochures will be there for 9/11 activists to hold up and to pass out. Come out and join us for a couple of hours or even a full day. To learn more about this event, see AnswerCoalition.org. Contact Rachel Colton at 202-361-8169 or by email. They will be coordinating meet-up plans for the various 9/11 Truth actions in Washington, D.C.